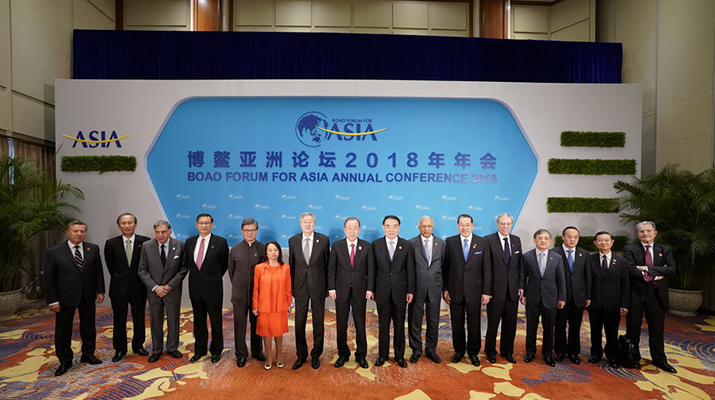 The General Meeting of Members of the Boao Forum for Asia (BFA) elected the new board of directors on the morning of April 9. At the ensuing first meeting of the board, Ban Ki-moon, the eighth Secretary General of the United Nations, was elected chairman of the board. Zhou Xiaochuan, Vice Chairman of the 12th National Committee of the Chinese People's Political Consultative Conference and former Governor of the People's Bank of China, replaced Zeng Peiyan as the chief representative of China to the BFA. According to the BFA Charter, the chief representative of China is the ex-officio member and the vice chairman of the board. At the meeting of the board, Li Baodong, a vice minister of foreign affairs of China, was appointed secretary general. According to the BFA Charter, the secretary general is the ex-officio member of the board. The new board of directors consists of 19 members, of which 12 are newly elected members, including Ban Ki-moon, Zhou Xiaochuan and Li Baodong, and seven members from the previous board, including Yousef Abdullah Al-Benyan, Vice Chairman and Chief Executive Officer of SABIC; Shaukat Aziz, former Prime Minister of Pakistan; Mao Chaofeng, Executive Vice Governor of Hainan Province; Dame Jenny Shipley, former Prime Minister of New Zealand; Surakiart Sathirathai, former Deputy Prime Minister of Thailand; Susilo Bambang Yudhoyono, former President of Indonesia; Ratan N. Tata, Chairman Emeritus of Tata & Sons. The 12 newly elected members are political and business leaders from Asia and the world, including Gloria Macapagal Arroyo, former President of the Philippines; Carlos Gutierrez, former Secretary of Commerce of the United States; Yasumi Kudo, Chairman of the Board of NYK Group; Oh-Hyun Kwon, Chairman of Samsung Electronics; Vincent Lo Hong-Shui, Chairman of Hong Kong Trade Development Council; Hiroaki Nakanishi, Chairman of the Board of Hitachi Ltd.; Romano Prodi, former President of the European Commission and former Prime Minister of Italy; Wong Kan Seng, former Deputy Prime Minister of Singapore, Chairman of Ascendas-Singbridge Pte Ltd.; Viktor Zubkov, former Prime Minister of Russia and Chairman of the Board of Directors of Gazprom. According to the Resolution of the New Board of Directors, 11 outgoing members of the previous board are invited to the council of advisors, including former Chairman Yasuo Fukuda; former Vice Chairman Zeng Peiyan; Zhou Wenzhong, former Secretary General of BFA; Tun Abdullah bin Haji Ahmad Badawi, former Prime Minister of Malaysia; Victor Fung, Group Chairman of the Fung Group; Goh Chok Tong, Emeritus Senior Minister of Singapore; Leif Johansson, Chairman of the Board of Directors of Ericsson and Chairman of the Board of Directors of Astra Zeneca PLC; Sergey Katyrin, President of the CCI, Russia; Henry Paulson, former Treasury Secretary of the United States; Jean-Pierre Raffarin, former Prime Minister of France; Mikio Sasaki, Senior Corporate Advisor of Mitsubishi Corporation. Also invited to the council of advisors are Mme. Margaret Chan Fung Fu-chun, Director General Emeritus of World Health Organization; Chey Tae-won, Chairman of the SK Corporation; Henri Giscard D’estaing, President of Club Med SAS. The new council of advisors now consists of 17 members, including three members from the previous Council--Andrew Forrest, Chairman of FMG; Jiang Sixian, Chairman of the University Council of Shanghai Jiao Tong University; Xu Lirong, Chairman of the Board of China COSCO Shipping Corporation Limited. At the first meeting of the new council, Yasuo Fukuda was elected Chairman and Zeng Peiyan was elected vice chairman. According to the Resolution of the General Meeting of Members, eight outgoing members of the previous council of advisors were honored with the title of BFA honorary member in recognition of their outstanding and substantive contributions to the forum since its inception, including Fidel Ramos, former President of the Philippines; Lan Fok Chun Wan, Governor of Fok Ying Tung Foundation Limited; Bob Hawke, former Prime Minister of Australia; Jiang Xiaosong, Chairman of Hainan Grand Lecheng Development Holdings Co. Ltd.; Long Yongtu, former Vice Minister of Foreign Trade and Economic Cooperation; Sergey Terechshenko, former Prime Minister of Kazakhstan; Koji Miyahara, former Chairman and Board Counselor of NYK Line; Michael Treschow, Chairman of the Investment Committee of Wallenberg Foundations AB.